The art of creating patterns and designs by arranging small pieces of coloured glass has been utilized since the time of ancient greeks. Greeks were infact responsible for many of the beautiful art work created in Byzantine time. Its time did not end there, as glass mosaic tiles remains to this day one the best and practical ways to bring artistry to your home. We have good quality of Glass Mosaic Tiles. 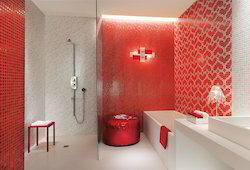 The application of random mix glass mosaic tiles are as under. Bathroom Wall Glass Mosaic Tiles. Garden Wall Glass Mosaic tiles. Living Room Glass mosaic tiles. Water pool glass mosaic tiles. Fountain water glass mosaic tiles. We take complete Glass Mosaic tiles application work in very attrective price of Glass Mosaic tiles with Glamosaic Tile Adhesive and Epoxy Grout, we also do water proofing before fixing Glass mosaic tiles, request to contact or send inquries for all your requirements. We are aslo looking for Dealers Glass mosaic tiles in your region. By keeping in mind defined quality norms, we are engaged in offering an exclusive Bathroom Glass Mosaic Tiles. hese mosaic tiles are available to clients in different shapes, sizes and colors. These tiles have a scratch-resistant surface and flawless finish. 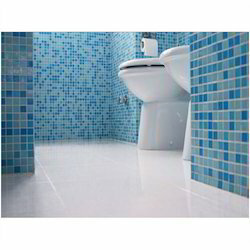 These tiles are available to clients in a range of specifications. 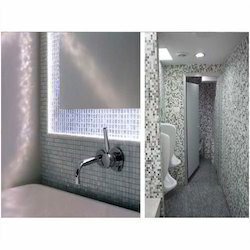 Pristine Mosaics is leading manufacturer and exporter of Bathroom Glass Mosaic. 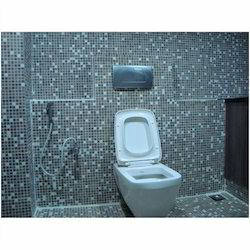 Supplier and exporter of Bathroom Glass Mosaic Tiles.